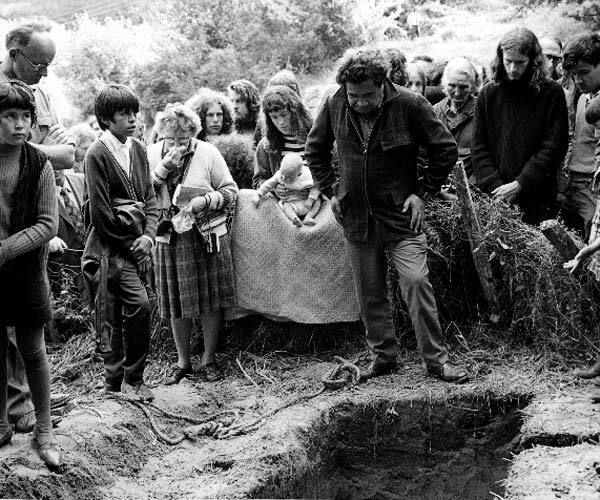 Poet Hone Tuwhare (standing, centre) conformed to Māori tradition at the funeral of his old friend and fellow poet James K. Baxter in 1972. Standing at the edge of the grave, Tuwhare farewelled his friend not only with a solemn poroporoaki (spoken farewell) but also with hilarious reminiscences and affectionate insults. This is a longstanding custom in Māori society and reflects honour on the person so addressed. It also serves to lighten the mood of the bereaved family and other mourners, and makes a tangi more distinctive and memorable.